Easy Way To Hard Reset Lenovo S60. We will give our Lenovo S60 away to someone else, and we don't want that one know everything about our secret data, so we have to erase all data before back up it. There are many bugs on Lenovo S60. We want to remove all personal data and setting that was stored in Lenovo S60.device. We have forgotten on PIN or Pattern Lock at Lenovo S60. Lenovo S60 will continue to hard reset process to restore factory default. Turn Off your Lenovo S60 by hold and press Power Button for a second. Release any SIM card and SD card that was installed on your Lenovo S60 smartphone. On this screen, you can use Volume Up or Volume down button to highlight the menu, and use the power button to confirm your selection. Now, you can select wipe data/factory reset and confirm it using Power Button. On the next screen, you can highlight Yes--delete all user data use volume down button to highlight the menu, and confirm it using Power Button. Just wait the hard reset process until finish. 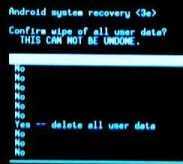 Once hard reset process finished you can select Reboot System Now to reboot your device. You can wait a while for Lenovo S60 to reboot the system. 0 Response to "Easy Way To Hard Reset Lenovo S60."